A full-size power chair is one of the best options for people with limited mobility who refuse to sacrifice an independent lifestyle. The Merits P326A Vision Sport is one of our top sellers due to the great quality you receive for such an economical price, especially here at Preferred Health Choice. This mid-wheel drive power wheelchair has everything you need for the versatility of moving around outdoors as well as navigating rooms and hallways indoors. As a mid-wheel designed electric wheelchair, the Merits P326A can essentially turn in place, making it incredibly easy to make tight and narrow turns or sharp directional changes. With 6-inch tires in the front and back, and 10-inch tires in between, it can also boast a small and efficient 20-inch turning radius for the smoothest transitions. The Vision Sport’s dual in-line motors provide you with 18 miles of travel at a top speed of 5 mph. The heavy-duty motors and low center of gravity not only make it possible for gentle transit, but are also the reasons why this power chair is at the top in terms of operation and performance. If you’ll be spending a majority of your days in a power chair, it should definitely be pleasant to sit in. 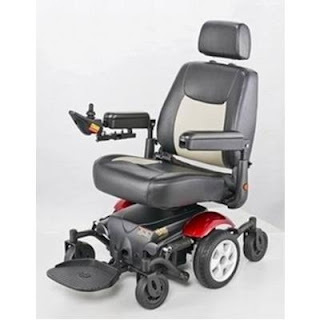 The Merits P326A power chair offers basic features for comfort and more. It has an impressive 20-inch captain’s seat and can accommodate patients weighing up to 300 pounds. A semi-reclining backrest allows the chair to be a place for relaxation when not in movement, and the arms can adjust to the user’s desired height and width, or even flip up when they’re not needed. At PHC, we love providing our customers with premium quality equipment that improves their daily standard of living. Feel free to call us at 866-722-4581 for more information about the Merits Vision Sport or any of our other home medical equipment and supplies.